It was not easy to get the design for my abstract tulips. I selected some commercial fabrics in white/silver to refer to the black and white. The background technique is strip-piecing. I simplified the shape of the tulip to a kind of triangle. I cut pink batik fabrics in very small pieces, covered it with pink voile and quilted this free motion to create a new fabric. This new fabric I cut in triangle shapes. This shape is also used for green tulle parts behind the tulips. The leaves are also simplified to triangles and are fused on the background. The stems are made with zigzag ribbon. I quilted straight lines in the directions of the tulip-shape. Very effective, it gives the impression of a very simple design which is actually constructed in minute detail, lovely work. The use of the green net is really clever. The simplicity of the design gives lightness and elegance. Well done. I like the use of green tulle on the background fabric, it is subtle but gives life. 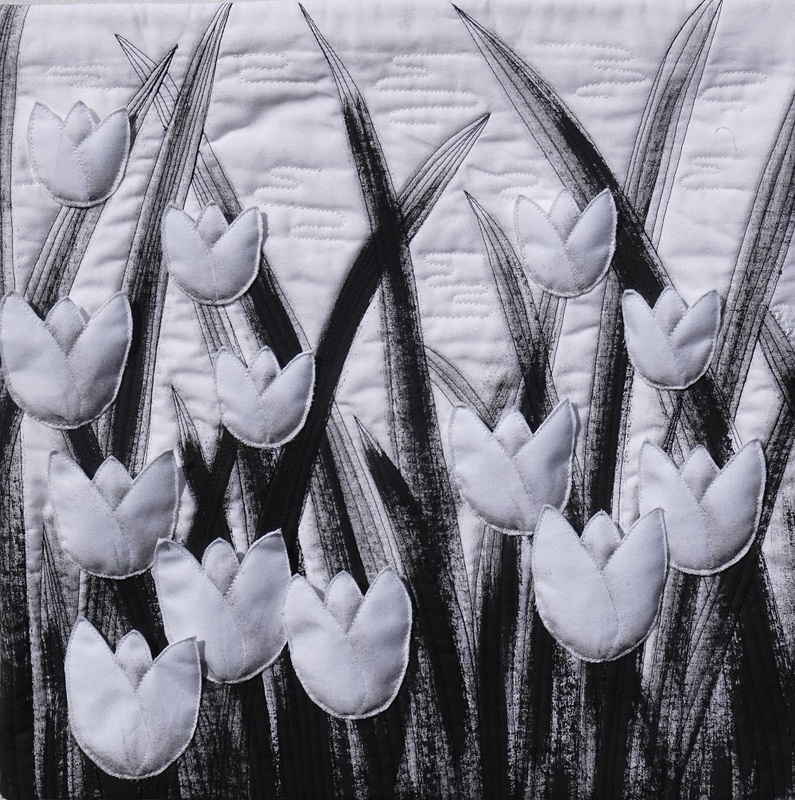 I love the way you have created the new fabric for the abstract tulips. This is a lovely design and works very well. A very good example of less is more. The new fabric for the tulips is really nice and the green tulle shape in the background definitely adds something extra to the design. All the lines in your quilt are making your tulips stronger. A very nice design, great use of colour and contrast and an effective abstract effect, my compliments Greetje. I love the different textures that you gave with the background. Awesome work. A soft, sweet but very effective design. The new fabric you created, the rick rack and the green tulle adds texture and dimension. Nicely done Greetje.